Willis, Freeman, Malkovich, Mirren, Cox. Throw in a Borgnine and a bit of Dreyfuss, and you've got a cast worth watching. RED (Retired and Extremely Dangerous) marketed its lineup heavily, and for good reason. These international treasures hopefully will not abandon making high art, but it's grand to watch them having a great time. The implication, of course, is that RED is not high art, but neither does it attempt to be. It's an action comedy with the above heavyweights as ex-CIA, MI-6, and KGB agents forced to come out of retirement and fight for their lives as they try to unravel why they need to fight for their lives. Mary-Louise Parker is dragged unwillingly (at first) on the grand adventure and Karl Urban is the current CIA agent charged with bringing the senior team down. Urban and his boss, played by Rebecca Pidgeon, are directed in a completely different manner than our heroes. They play it entirely straight, as if they were in a Bourne movie. It makes the contrast with the bonhomie of the others, who have already seen everything that can be seen and have made it out the other side, that much funnier. RED plays as if it's self aware. It namechecks the action tropes — thousands and thousands of rounds fired with casings littering the ground, characters appearing miraculously in the right place at the right time, the Russian is named Ivan (although I briefly flashed back to the line in The Wire, "Boris. Why always Boris? "), and the revelation early in the film of a terminal disease leading to a later noble act of sacrifice. But there's another layer there as well, including a visual Sergio Leone reference, and a musical James Bond one. Malkovich says at one point, "I remember the Secret Service being tougher," a possible shoutout to In the Line of Fire and a contemporary of the retirees, Clint Eastwood. Other than noticing that the French Quarter of New Orleans was completely abandoned in broad daylight (spring for some extras, will you) I was more than willing to go along on this ride. 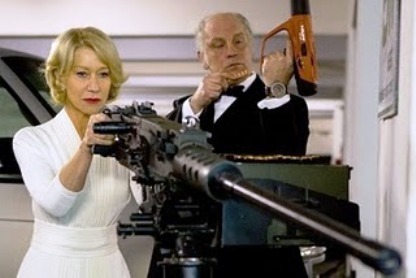 Willis and Urban get to dust it up, and I utterly loved that the giant guns were in the lovely hands of Helen Mirren. Malkovich is mostly nuts or partially lucid, depending upon how hard you squint. Practically the entire plot is a MacGuffin, but when you've got John Malkovich running screaming down the street with explosives and a Flava Flav clock around his neck, as well as one of the most perfectly applied and exquisitely timed FUs in film, who needs it? Just enjoyed this movie on DVD last night. I thought Mary-Louise Parker did a very good job. A segment when they were infiltrating CIA headquarters caught my eye. In a segment where all she was required to do was to walk down the hall, she added the character business to make it come alive... making the most of her camera time. That's creativity and acting smarts to me.